Wow I stink out loud at drawing guns. I better practice more. I must say, the multicolored goggles are definitely something. I would rock them SO HARD!!! Also, I love Schtein’s angry face in the last panel. Haha, Schtein needs to focus less on feelings and more on crazy prison. Focus, Schtein! Schtein, they lied to you. And I’m sure Osgood will think of something. And yes, his angry face is wonderful. Yeah, Doc, gotta agree…not one of your brighter moments. Am I going to be the first one to say that the first panel is amazing? The shading is really great. I have to admit, though, I kind of miss the monochrome. You were really dazzling when it came to shading in black and white. Still, I am excited for the next comic. And, as always, I love Schtein and his attitude. Each week is always fun to see where the plot is going. I was so impressed by the first panel, and was wondering where you find the stamina to invest so much effort in doing two pages of this sort of thing a week that I almost didn’t notice the rest of them were flats and gradients! Sneaky! oh no, my secret lazy methods. Exposed! It’s an AU, you can do what you want to, especially with weapons! he also forgot to ask her to look after his cat. So flustered! I based the masks off of real nightvision goggles. Some models totally do that red/green thing. But after I drew them I noticed they’re like Dr. Loboto’s eyes. Naw, not a wasted phone call, lawyer probably wouldn’t have done any good in this disaster anyway. Wow, neat comic. 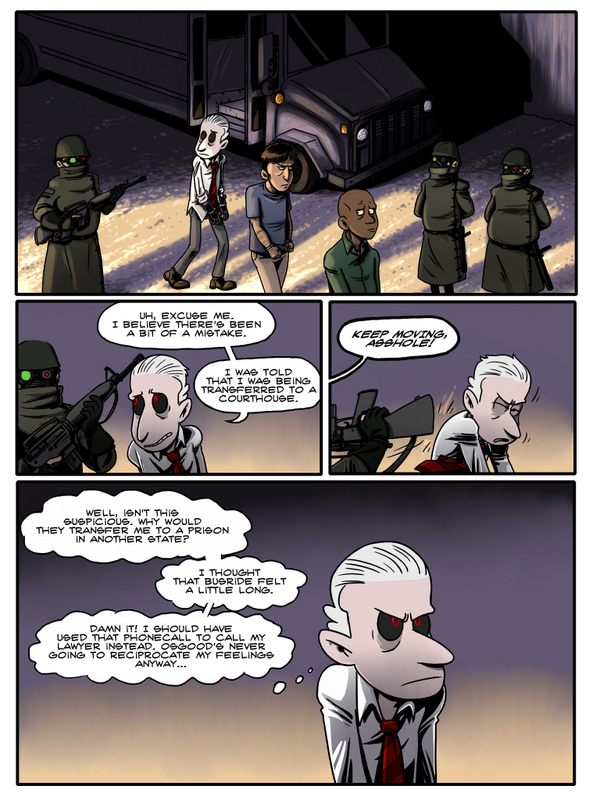 I was just randomly going through topwebcomics and was getting seriously bored with all the lesbian-elves-with-mysterious-dreams junk… but this takes me back to when I was a kid and wrote comics inspired by Back to the Future (christopher lloyd ++). Found this yesterday, bookmarked today, and I’ll be doing that TWC voting thingie every week with the rest of the zombified String Theory fans. Heh the submit button is shiny! Aw, thank you so much. I’ve been hoping that actually being active on topwebcomics would help bring in new readers. Hooray! Funnily enough, I read the Meek and didn’t find ST through that… because I only skim the comments on that comic : ) Speaking of which, I also found the Meek through TWCs. PS saw some other stuff on DA and man, you gotta find a way to incorporate those college years into this comic. The Tweek/Crack-Bear astronomy guy is just too funny! So they *did* skip the trial, then? Suspicious, indeed. And probably illegal, too. Being kind of a mad scientist, I thnk, given the direct military oversight and the carnage that ensued, that he’d be locked up pretty securely before court marital proceedings begin. Of course, the question: Is he working for a US government project? In a country with adversarial law, you can go to prison before the trial, and the trial is to prove your innocence (not every country’s jurisprudence believes that you are “innocent until proven guilty”) and this is set in a timeline where he may be operating in the US under Martial Law. It is the US government, and you’re right about the martial law, actually. The US is having some major problems I haven’t gone into yet. Habeas Corpus has been suspended for some time. He still should have had a trial, though. He’ll figure out something. He’ll get a hold of like batteries in and a toy – pull a McGuyver – and make a plasma conductor and blow the crap outta that place. Or visa-via, Osgood will do the same thing – with better equipment. I noticed I forgot to add those details after I uploaded the page, too. I usually add those last. I’ll probably fix it later. Wait, when did Schtein get his tie back? I’m sure he got it back when he was removed from holding. They only take things like that away to make sure you don’t kill yourself. Hahaha, those guards are so chubby. Also, your drawing style is great. Even really depressing panels aren’t so bad, because Schtein’s face is so humorous! Okay, ya. All of that in a continuous stream of vocalization during the reading of your comic that lasted a only a few minutes, but now I hear sirens and I’m pretty sure someone called the police. No. No, that’d be my imagination. Uber love for String Theory. Haha, I love how he called Osgood in his time of need, and is now regretting it. Besides he was part of a secret military organization, he didn’t really think he’d get a trial did he? What happened to Stein’s cuts and blood? Oh gosh, that last panel; it just …agh. Please put your blood back on, it’s so meh….